Read A Book And Plant A Tree. Feeling guilty about buying the latest bestseller from the bookstore? Can’t find that book used so you have to buy it new? 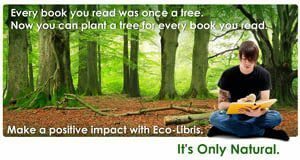 If you always give some serious thought as to how your books were made and wish you could do something about it, you might want to check out Eco-Libris. About 20 million trees are being cut down EVERY YEAR to produce the books sold in the U.S. alone, so planting a tree for every book that gets read is a good way to try to replace some of the damage. Our planting partners are organizations that work in developing countries. Their planting and conservation activities are an integral part of their efforts to help local communities in these countries move towards a sustainable future. We make sure that your trees will be planted where they provide significant value for both the environment and the local communities, who are very much involved and play an important part in the planting projects. Anyways, check it out if you get a chance, pretty cool idea. Eco-Libris.